Drayson Racing and Vantage Power team up to tackle the RAC Future Car Challenge and develop ultra high performance electric cars. Enter first electric vehicle to drive the entire length of the Pan-American Highway in Brighton to London Challenge. Form Technical Partnership to develop electric drivetrains with high performance and endurance. 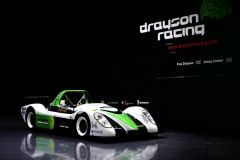 Drayson Racing Technologies LLP, the leading green racing R&D business, has teamed up with Vantage Power Ltd, the team behind the world record breaking SRZero electric car that last year drove the 26,000km Pan-American Highway in 70 days as part of the Racing Green Endurance project. Together, they will tackle the 60 mile RAC Future Car Challenge Race from Brighton to London on November 5th 2011, and look forward to a series of exciting events in the future. Vantage Power Ltd and Drayson Racing Technologies LLP also announced today the formation of an official technical partnership which aims to combine Vantage Power’s experience in extreme endurance runs with Drayson Racing’s knowhow in high performance motorsport, to develop drivetrains for electric vehicles with both high performance and long range. The SRZero will be driven in the RAC Future Car Challenge by the co-founder of Drayson Racing, former Science Minister and Le Mans racing driver Lord Paul Drayson, and the Head of Imperial College’s Energy Futures Laboratory Prof Nigel Brandon.